NEW DELHI, India -- India has undertaken a major project with Ukraine to upgrade its AN-32 transport aircraft, the lifeline of the armed forces in parts of Jammu and Kashmir and the Northeast, with the first batch of the planes in Kiev for extension of their technical life by another 15-20 years. The five planes, which are often called Beasts of Burden, are undergoing modernisation work in the Ukrainian capital since early this month as part of a $400 million accord under which their payload-carrying capacity will also be increased, IAF officials said in New Delhi. The fleet of 105 aircraft, inducted since mid-80s, will be upgraded under the agreement reached between India and Ukraine in June last year. Their modernisation was required as they were nearing the end of their technical life of around 25 years, the officials said. The upgrades will help in increasing payload carrying capacity of the aircraft from around 6.7 tonnes to 7.5 tonnes, they said. Under the agreement, the first 40 aircraft will be upgraded in Ukraine whereas the remaining 65 will be upgraded at IAF's Base Repair Depot in Kanpur. The aircraft will also be fitted with equipment like air collision avoidance system, ground proximity warning system, satellite navigation system, distance measuring equipment, upgraded radio altimeters and improved seats for crew members, they said. 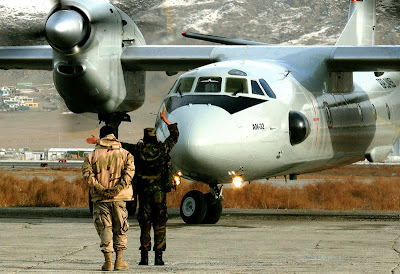 The AN-32s are considered to be the lifeline of Indian armed forces in Ladakh in Jammu and Kashmir and parts of the Northeast, where troops heavily depend on supplies dropped by the aircraft for their survival. The aircraft was especially designed by erstwhile USSR as per the Indian specifications of operating at altitudes above 3,500 metres in its hilly terrain. The aircraft is also used in bombing roles by Agra-based Striking Yaks squadron and para-dropping operations of both the Army and the IAF.